The Salinas tungsten wedding band is the perfect symbol of power for anyone who wears it. 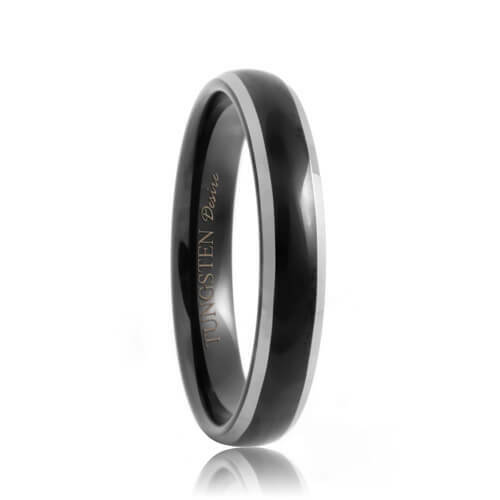 This style of black tungsten bands are the leading edge of modern fashion. The deep and dark color of the black tungsten center creates a striking contrast with the brightly polished beveled edges. This is the perfect ring to express your unique style. Ships within 1 business day. Free Lifetime Warranty and Lifetime Sizing; pay no restocking fees or deductibles! I must admit, I was a bit apprehensive purchasing the wedding band online without looking at it first. With the 365 day money back guaranty, the glowing reviews and how easy it was to buy, we took the leap. When we received the tungston wedding band, we opened the ring box and it was so beautiful and it looked better than the rings at the mall for half the price. The ring box is beautiful as well. I am very satisfied with the ring quality, customer service and the savings I got from Tungston Company. You can tell the leap is worth it. The ring was better than what we hoped for and it looks better in person.